There is nothing like a great portrait. Really good portraits stand out because the subject (especially the eyes) is sharply focused while the background is blurry. This sharp subject versus blurry background creates drama that draws the attention of the viewer to the subject where it should be focused. The contrast between what is in focus and what is out of focus is known as “depth of field.” A good photographer knows how to control the depth of field, and that is what creates the great shot. Understanding and being able to control depth of field is paramount to getting the portraits you desire. In fact, it is the most important technique in this type of photography. The first thing you need is a proper camera. A DSLR camera lets you control the depth of field (it is possible with point-and-shoot cameras but you have less control). The second thing you need is a good portrait lens. 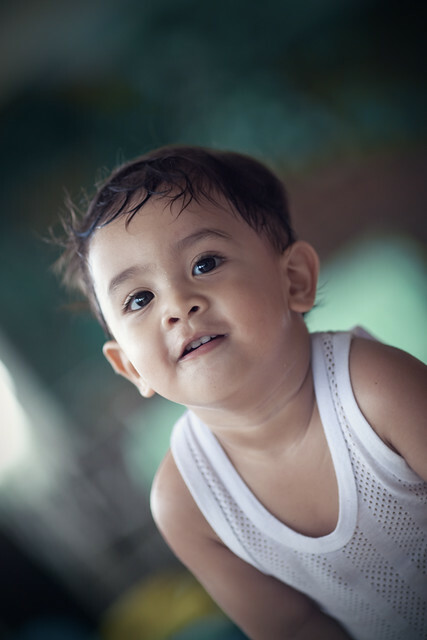 Not just any old lens qualifies as a portrait lens, but you might be surprised at how many will qualify if you know some of the techniques involved in controlling the background blur. The first is a telephoto range of between 50mm and 135mm, with the optimum being about 85mm. That means that a zoom lens will work, although many photographers prefer prime lenses for this type of photo shooting. The second lens requirement is a wide aperture. Normally f/2.8 and wider are the best, but for longer focal lengths, you can use up to f/4.0. Attach a lens with the proper focal length to your camera. Longer focal lengths are best at reducing the depth of field (when set at the correct aperture, as you will see below). There are many photographers who love using a 70–200mm zoom lens for portraits. Others use 85mm lenses for their best shots. Wide angle lenses do not work well for shooting portraits. Set the camera to Aperture Priority mode and set the aperture at a very wide setting (smaller f-number). The lower the number, the wider the aperture, and the wider the aperture, the less depth of field there is in the photo. For example, with an aperture of f/1.4, it is much easier to get a shallow depth of field than it is with an aperture of f/4.0. Position the camera at the correct distance from the subject. This is a variable that will depend on the focal length of the lens, but you should be at the closest distance from the subject that will fill the camera frame with the subject. The closer the camera is to the subject, the less depth of field there will be in the final image. In simple terms, if the subject is only 10 feet from the camera, there will be less depth of field than if the subject is 20 feet from the camera. Practice, practice, practice. The more experience you have, the more you will understand the effects on depth of field that each one of the settings mentioned have on the final outcome. The best portraits are a result of using the right equipment along with the techniques outlined above. Contrary to what you may think, a good portrait lens will help more than a more expensive DSLR camera. Thanks! Your tips on portrait photography is really useful!! Thanks to you I did some amazing portrait shoots lately and have another big gig next month. Although I was familiar with most of the tips that you gave, some of them were new to me. Most DSLRs have a bottom closer to where the lens is that will let you see what is in focus. The lens close to the selected aperture and you can see in the viewfinder what is in focus. While its is normally very important to have the eyes in focus, a good portrait is not only the one that you have the background blur. In a lot of cases, you want the background well exposed and in focus and sharp to complete the portrait. The best setting for a portrait session is manual as you need to be in control of your speed and aperture. Would the distance from subject to background also be a factor? Also, to get that headshot, you’d have to closer than 10′ at 85mm, no? Thats a bit generalized. all the bokeh hype. There are several shots to be taken, that dont look better with shallow DoF. with a black background, it virtually doesnt matter. sometimes you want a certain amount of blur, keeping the focus on the subject but leaving the background recognizable. There are several other methods of separation. Bokeh works great many times, but color or and light differences can be enough for separation and great detail everywhere in the picture, at f8-18, is sometimes better than bokeh. Or, you know, blur tool.